The future of the online daily fantasy sports industry seemed in jeopardy toward the end of last year, after an insider trading-like scandal prompted intense scrutiny and triggered efforts nationwide to regulate or even shut down the companies in some states, like New York. New York Gov. Andrew Cuomo signed a bill Wednesday legalizing online daily fantasy sports in his state. The move paves the way for New York-based FanDuel and Boston-based DraftKings to resume operations in one of their most lucrative regions, just in time for the start of the NFL season (and perhaps another relentless barrage of ads). New York became the eighth state this year to pass daily fantasy sports legislation, joining Colorado, Indiana, Massachusetts, Mississippi, Missouri, Tennessee, and Virginia, according to Legal Sports Report, a website that tracks the industry. The Massachusetts legislation hasn’t generated a lot of attention; the language was tucked near the end of a broader economic development bill passed late Sunday night at the end of the state’s legislative session. The bill officially legalizes the industry and requires companies to follow the regulations laid out by state Attorney General Maura Healey in March, which were mainly aimed at protecting less experienced players and increasing industry transparency. The bill also calls for the creation of a special commission to study fantasy sports and online gaming, which would explore issues like possible taxation and consumer protections. The Massachusetts bill still needs the signature of Gov. Charlie Baker to take effect. The measures passed by state legislatures around the country move DraftKings, FanDuel, and their competitors firmly out of a legal gray area. The companies’ websites allow users to pay a fee to play short-term fantasy contests against millions of opponents and potentially win large sums of money. Users draft a lineup of players and earn points based on how well those players perform. But critics have questioned the legality of the industry, saying the games are basically the same as sports gambling, which is illegal in most states. The companies have relied on an exemption in a 2006 federal law that banned online poker but allowed fantasy sports, which were categorized as games of skill and not chance, and therefore don’t fall under the purview of gambling laws. New York’s law removes that uncertainty and classifies short-term fantasy sports contests as games of skill, not chance. The law imposes restrictions on the games aimed at protecting consumers: these include banning people under 18 from playing, requiring that highly experienced players be identified so less experienced players understand who they’re up against, limiting the number of lineup entries that one player can submit for a contest, and prohibiting games involving horse racing and high school and college sports. Daily fantasy sports companies must also pay the state a tax equal to 15 percent of their New York revenues, plus an annual fee of up to $50,000. Cuomo projects taxes on the industry will generate $4 million per year, to be put toward New York’s education system. New York state Sen. John Bonacic, one of the bill’s sponsors, framed the legislation as a model for other states. Not surprisingly, DraftKings CEO Jason Robins (pictured above) and FanDuel CEO Nigel Eccles both issued statements supporting the law. “With the future of fantasy sports affirmed in New York, we expect our legislative momentum will only accelerate as more states address the issue,” Eccles wrote in his prepared statement. New York Attorney General Eric Schneiderman said he will “enforce and defend the new law.” Schneiderman sent a cease-and-desist letter last November claiming daily fantasy sports companies were running illegal gambling operations and should shut down immediately. 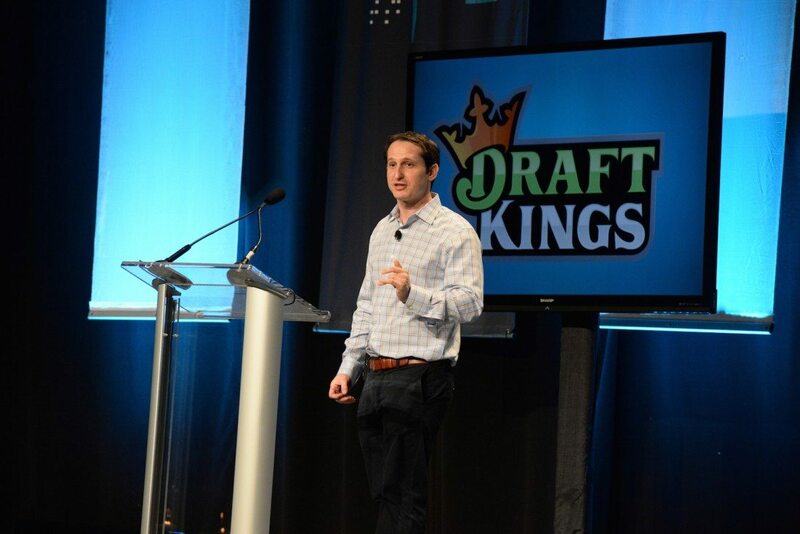 DraftKings and FanDuel responded by suing Schneiderman and the state of New York. After some back-and-forth in court, the companies agreed in March to stop operating in New York as part of a deal with Schneiderman that effectively served as a temporary ceasefire, with the attorney general asking a state appellate court to delay hearing the case until this fall. The companies seemed to be betting that the New York legislature would in the meantime pass a bill authorizing their operations, which it did in June. The agreement between Schneiderman and the companies did not apply to his allegations of false advertising and consumer fraud. Schneiderman said on Wednesday that he will continue pursuing those claims.